Novak Djokovic says he is motivated by “having a shot” at Swiss great Roger Federer’s all-time men’s record of 20 Grand Slam victories. 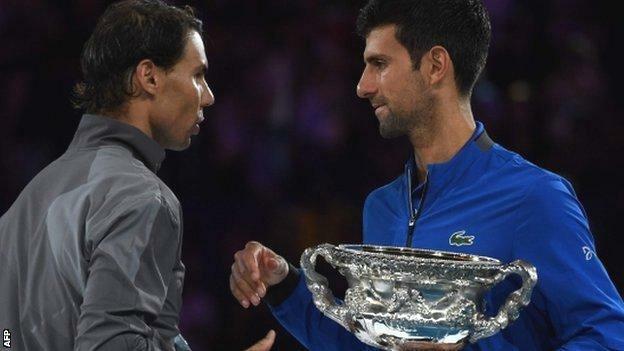 The 31-year-old Serb, the world number one, thrashed great rival Rafael Nadal 6-3 6-2 6-3 to claim his 15th major in Sunday’s Australian Open final. It was his third Slam in a row, having won Wimbledon and the US Open in 2018. “I’m aware that making history in the sport I truly love is something special,” he said. Top seed Djokovic’s record seventh men’s singles victory in Melbourne moved him outright third ahead of American Pete Sampras in the all-time list, closing in on Federer and Nadal (17). “Of course it motivates me,” he said. “Playing Grand Slams, the biggest ATP events, is my utmost priority in this season and in seasons to come. “How many seasons are to come? I don’t know. I’m not trying to think too much in advance. Djokovic, who reclaimed the world number one ranking in November, will go to the French Open in May aiming to hold all four Grand Slam titles simultaneously for the second time in his career. Victory over Britain’s Andy Murray in the 2016 French Open final meant Djokovic became the first man since Rod Laver in 1969 to hold all four majors at once. “I have to work on my game, my clay-court game, more specifically than I did last season,” Djokovic said. “I need to play better than I have last season. I am already playing better but I mean on clay specifically, in order to have a chance and shot at the title. “The ultimate challenge there is to win against Nadal. Then you have Dominic Thiem and Alexander Zverev, Roger is probably going to play. Djokovic was ranked outside the world’s top 20 last July after coming back from elbow surgery but has shown he is back to his best. “Twelve months ago it was highly unlikely I would be holding three Slams,” he said. “Not impossible, but highly unlikely. “I don’t want to sound arrogant, but I always believe in myself. “I think probably the biggest secret of my success, if I can say, or probably any other athlete, is self-belief. “Always digging deep in the moments when you’re facing adversity, digging those moments of complimenting yourself, visualising yourself as a winner, trying to be in a positive state of mind. “Twelve months ago after the surgery because I wasn’t playing well, I wasn’t feeling good on the court – I was questioning everything. Djokovic said victory over Nadal in Sunday’s one-sided final ranked “at the top” of his 15 major triumphs. It was the Serb’s biggest margin of victory in a Grand Slam final. 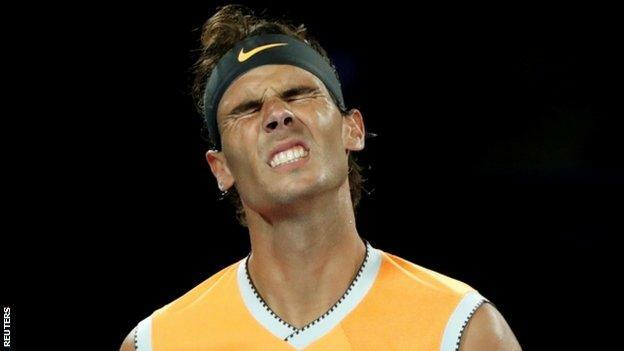 Djokovic made only nine unforced errors against Nadal, taking his tally to just 23 in his final three matches – a total which was fewer than the number he had made in each of his opening four matches. “Under the circumstances, playing against Nadal, such an important match, it’s amazing,” he said. “In back-to-back semi-finals and finals, to make so few unforced errors is pleasantly surprising to myself. Nadal said comprehensive defeats like this one happened to “even the best players in history”. The 2009 champion had not dropped a set on his way to the final but the fact he had come into the tournament without competitive action since September’s US Open because of injury seemed to catch up with him. “The way he played was unbelievable,” Nadal said. “But at the same time it is true that physically I was not able to have that extra thing. “I have been playing against a player that was at the highest level possible. “With the way he was hitting, maybe it was difficult to beat him even if I was at my 100%. “I have been lots of months without having the chance to practise, without having the chance to compete. I definitely think Novak could beat Roger’s Grand Slam record. It will be interesting to see how he manages to maintain this level. He knows what it has been like to feel his best. It was only a matter of time before he found that again. It has been frustrating for him at times but it shows how motivated he has been to get that level back. It’s a great achievement for him and his team. He made it look so effortless and so easy out there but there is so much hard work that goes into it – from every bite that he puts in his mouth, every recovery practice is with a full focus. He likes it to be all Zen.